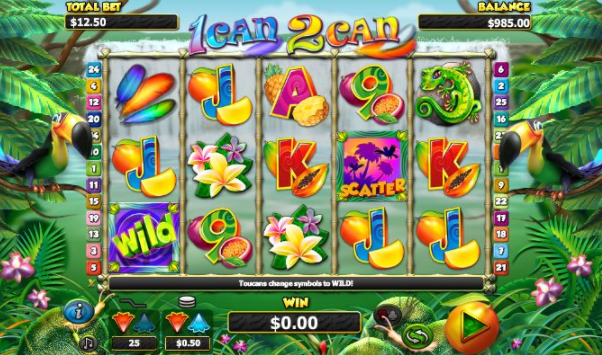 An established and highly-regarded online slots developer, NextGen’s catalogue of games is diverse, but they’re known for creating some of the very best animal-themed slots games out there. With stunning artwork and high-res graphics, their games are always a delight to look at. This slick finish is founded on compelling, bonus-rich gameplay sure to appeal to both online slots novices and seasoned players. After a brief, colourful information screen explaining the game’s bonuses, we enter the heart of the rainforest, and start spinning. The five game reels feature a variety of fun and exotic symbols, including bright feathers, laid-back sloths, cheeky green lizards, and J, Q, K, and A letters accompanied by different types of fruit. The background is a lush jungle canopy, and directly behind the reels, a waterfall tumbles continuously into a relaxing pool. Two toucans preside over the reels, one on either side. WILDS – the green WILD symbol substitutes for any other symbol, apart from SCATTERS. 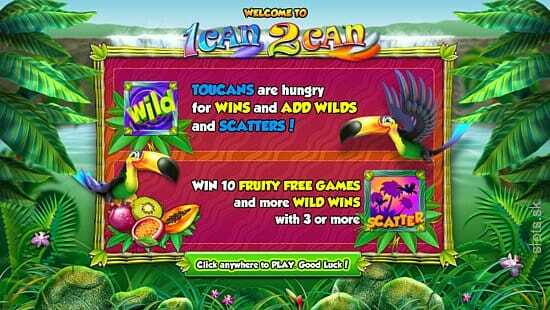 SCATTERS – after each spin, there’s a chance a toucan might add one or more SCATTERS to reels 2, 3 or 4. This triggers a 1 Can 2 Can Scatter Bonus. FRUITY FREE PLAYS – when 3 or more SCATTERS appear on the reels, this means 10 Free Spins, at the bet and paylines of the triggering spin. 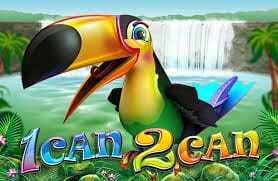 During Free Spins, toucans can add up to 3 WILDS to the reels, and Free Spins can also be retriggered, making for great winning streaks. GAMBLE – select ‘Gamble’ for the chance to multiply your wins. You’ll be asked to choose a card colour or a suit, and the correct colour will double your win, whereas the correct suit will quadruple it. The Autoplay, information and sound buttons are quite charmingly set into the shells of little snails down on the jungle floor, and the Autoplay function lets you set anywhere between 1 and 100 spins. The toucan’s animations are endlessly amusing to look at, too, so you won’t get bored as the reels spin by. The soothing soundtrack of rainforest sounds is a great contrast for the cheerful bursts of xylophone music as the reels spin.